Here at Plecto, we’re obsessed with displaying our dashboards on every screen. We display dashboards on our smartphones, computers and various television screens hanging around the office. That’s why when our Head of Sales Kasper Klit walked into the office a few weeks ago brandishing a new Apple Watch, we knew we had to make it happen. That’s right! Plecto users can now display their Plecto formulas on an Apple Watch. Of course, we can’t fit an entire dashboard on a 42mm screen (trust me, we tried). But, you can display any single metric. As Plecto users can attest, to display metrics on a Plecto dashboard, you must first create a Formula. The same concept applies to the Apple Watch integration: Create a Formula for the metric you want to stream, and push it to your watch using our iOS app. In addition to selecting the metric, you can set a target and control the time period. For example, the image below is showing (1) the sum of sales for the selected time period and (2) the budget. 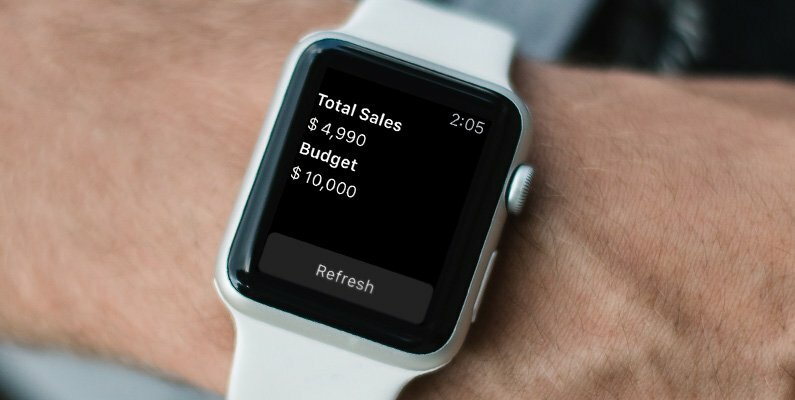 With our new Apple Watch integration, your metrics are never any further than your wrist. Log in to your Plecto admin to try the Apple Watch integration yourself, or start a free 14-day trial of Plecto. We have re-designed our website!